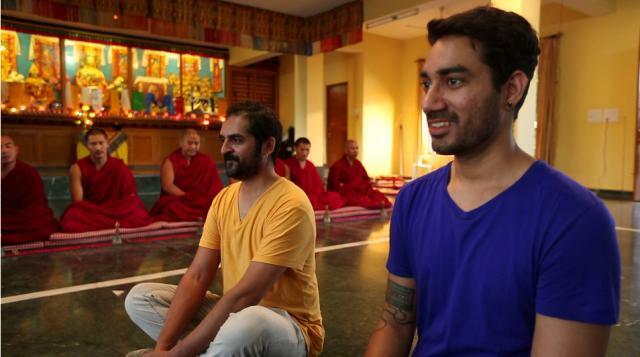 Sagar (right) with Sound Trippin’ co-host Karsh Kale. Sagar remembers Bandish Projektâ€™s early shows in Ahmedabad at college campuses including IIM and National Institute of Design. â€œStudents were open to new ideas, but we had a problem playing corporate gigs where the audience was more familiar with music played on the radio,â€ he says, â€œBut by early 2000, we were making a decent amount of money â€“ enough to not ask parents to buy us an audio mixer worth 30K.â€ Of course, the salability of radio music, as Sagar calls it and a change of location â€“ Sagar, Narvekar and Mehirr Nath Choppra, the third member of Bandish Projekt moved to Dubai in 2002 â€“ prompted them to release an album of Hindi film music remixes. â€œMainstream music was in big demand in Dubai. Iâ€™m not very proud of the remix album. It wasnâ€™t a direction that we wanted to go, but we just realized that Dubai wasnâ€™t a space for experimental music,â€ he says.